The new SingPass Mobile app is available on both the Google Play and Apple App Store. Citizens can now scan their fingerprints or faces to log into hundreds of e-government services, removing the hassle of remembering passwords. This is possible with the launch of SingPass Mobile on Monday (Oct 22), an app developed by GovTech, the agency behind public sector tech transformations in Singapore. But some users said they had trouble setting up their SingPass Mobile accounts. 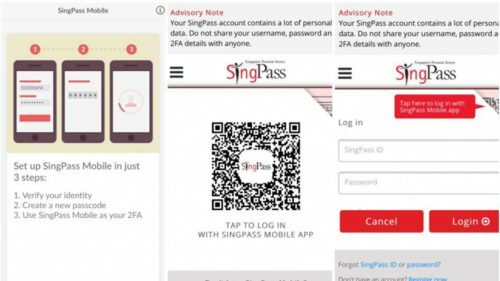 "The new SingPass Mobile app will offer a more convenient log-in option, as users no longer need to enter their passwords to log in," said GovTech's chief executive, Mr Kok Ping Soon, in a statement earlier on Monday. The new SingPass Mobile app is available on both the Google Play Store and Apple App Store. Its fingerprint scanning feature works with all devices, but facial scanning works only on Apple iOS devices. During the initial one-time set-up on the app, users need to enter their existing SingPass username and password, and then a one-time password delivered via SMS or their OneKey security token. However, several users experienced timeout issues when trying to set up their SingPass Mobile account on Monday. Users who complained on Facebook said they kept encountering an error message citing the error code 121. This prompted GovTech, which developed the app, to put up a notice on its Facebook page urging affected users to e-mail to its helpdesk their name, phone model, operating system version and mobile number to help troubleshoot the problem. The problem was unresolved as at 7pm.